Touch Forms Pro 7.2.1 – Drag-and-drop Web form builder. 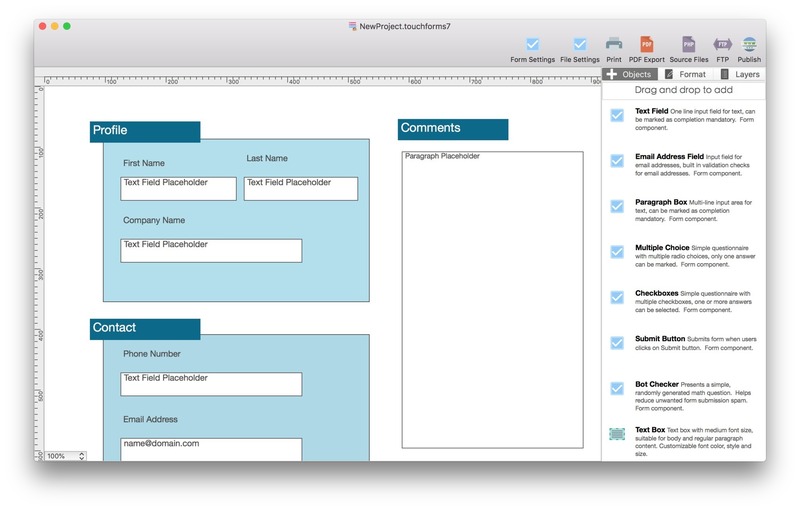 Touch Forms Pro is a simple-to-use web form builder. It’s full-featured, standalone software, purchasable via a one-time payment with no monthly subscription fees! Touch Forms allows you to build beautiful web forms with an intuitive drag-and-drop designer, publish to your own web host through FTP. The Pro Edition provides all-new advanced multi-form management interface and tons of new features, including new form SMTP delivery authentication settings, support for table grids, more text field input styling options, hover colors, and more! Next story SSDReporter 1.5.0 – Health-check for solid-state drives. Previous story TinkerTool System 5.95 – Change advanced OS X settings and more. Flinto 2.2.7 – Comprehensive prototyping. Flinto 24.4 – Comprehensive prototyping. Touch Forms Pro 7.0.1 – Drag-and-drop Web form builder.